Kokomo Apple Crepes - A recipe from Savor California, the online showcase for extraordinary gourmet foods and beverages from California. Prepare Kokomo Apple Chutney. Add sugar. Set aside. Whisk in eggs, egg yolk, and about 1 tablespoon milk, forming a smooth, paste-like batter. Add remaining milk and vanilla. Mix until no lumps remain. Mel butter in a nonstick crepe pan. Stir into the batter, leaving a film of butter in the pan. Let the batter rest at room temperature for 30 minutes. Thoroughly warm the crepe pan over medium heat. Stir the batter, and carefully ladle about 1/4 cup batter into the pan. Rotate the pan so that the batter coats the bottom and edges. Cook crepe until the edges are golden brown and lacy and start to pull away from the sides of the pan, about 2 minutes. Using a knife or an offset spatula, carefully turn crepe over. Cook other side until just golden, 30-40 seconds. Slice the crepe onto a heat-proof plate. Repeat with remaining batter, stirring each time. Stack cooked crepes with waxed paper between them, loosely cover with foil and keep warm in the oven. To serve, place a crepe on an individual plate. 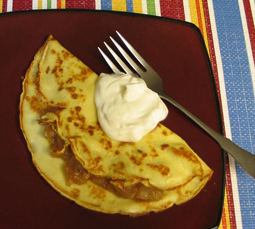 Spread Kokomo Apple Chutney on half of the crepe and fold it over. Top with sour cream or creme fraiche if desired.